Studies show that being around nature relieves stress, but not everyone has the time or opportunity to get away. Landscaping in Scottsdale is a great way to bring the de-stressing benefits of a natural setting to your home. Here are some tips for creating an outdoor stress-free zone in your own backyard. Comfortable Space - Having a beautiful yard only goes so far if there is not an inviting place to enjoy it. Create a sitting space that speaks to your personal preferences. Perhaps adding stylistic pavers and a padded bench will invite you to spend time outside. Or maybe you're more of the type to soak your feet in a fountain and listen to the gurgle of water moving over rocks. Perhaps a tranquil reading space, complete with a built-in shade structure will be just the thing for you. An outdoor kitchen with a functional dining area is another way to ensure you make use of your outdoor space. Privacy Landscaping - Ensuring that your space is free of peeping neighbors adds to your stress-free ability to enjoy the outdoors. Ask your landscaper about putting in privacy fencing, strategic planting, and even an artistic retaining walls. Having your own private oasis greatly adds to the feeling of peace and tranquility. Bring in the Elements - The more senses you are appealing to, the better drawn in you will be. As mentioned above, a water feature is one way to create an relaxing ambiance. Some other ideas might be a fire feature, outdoor lighting, a focal point, or a pool. Gardening - Of course adding living items to your yard will be a big part of creating a natural setting. Flowers, trees, and shrubs will bring in color, scent, and beauty to your yard. Discuss your landscaping goals with your contractor. You may want to create a colorful humming bird garden. Natural shade might be important to your outdoor design. Perhaps you want silvery plants that come alive under the glow of the moon. Personalizing your outdoor space, from decorative touches to customized landscape design, will not only create a lovely way for you to enjoy your natural surroundings, it also allows your worries to melt away. 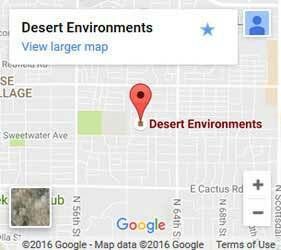 For ideas on landscape design that fits your style and yard space contact Desert Environments. Our landscape contractor in Scottsdale will listen to your needs and work with you to create a natural get-a-way without needing to leave home.